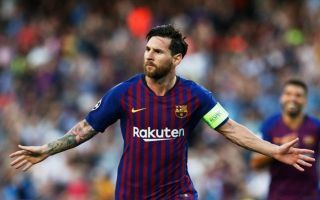 Lionel Messi is reportedly desperate to see his club seal the transfer of a new right-back this January as he’s unconvinced by Barcelona’s options in that area. Sergi Roberto and Nelson Semedo have shared duties in the right-back position in recent times, though neither is really anywhere near the calibre of club legend Dani Alves, who has been missed since leaving the Nou Camp in the summer of 2016. While no specific replacement seems to be in mind for Messi at the moment, the Argentina international is said to be eager for Roberto and Semedo to be replaced in the winter to deal with the bigger challenges that lie ahead for the side in the Champions League, according to Don Balon. The report states Messi is worried about what players like Neymar, Leroy Sane and Raheem Sterling could do against either Roberto or Semedo, and in fairness he’s probably got a point. When Barca were at their peak and regular winners in the Champions League, they had elite quality in every position, but they’ve struggled to replace something of a Golden Generation from the late 2000s up to the mid 2010s. It will be interesting to see how Barcelona respond to this situation, with Don Balon suggesting many at the club increasingly share Messi’s view.